Season Pass members were treated to a surprise look at live streaming video and audio of corps performances during the DCI Father's Day Kickoff from Lisle, Ill., on Sunday, June 18. Members had the opportunity to see a press box shot of the six performing groups, in addition to the scores announcement and the awards ceremony performance of "Champions Fanfare." "The live streaming concept is one that we are ramping up to for later events this summer. This was just a beta test that we used to get our feet wet with this project and one that we are getting excited to provide in addition to all of the other content we offer as part of our major event coverage," said Ricky Fritzsching, DCI's senior Web producer. "This experiment gave us the opportunity to test our technological limitations as we push forward into the season." The DCI Season Pass event coverage user interface. Nearly 100 Season Pass members were estimated to have viewed the live stream. "It was really a pleasant surprise to see this happen. The video quality was pretty good considering it was a live stream and a beta test. I think a lot of people based their decision to renew their Season Pass subscription on this feature last night," said Kevin Gamin, who is a Season Pass member in addition to Drum Corps Planet's managing news editor. "Just in this opening week of the season, coverage on the Season Pass has jumped leaps and bounds from last year." 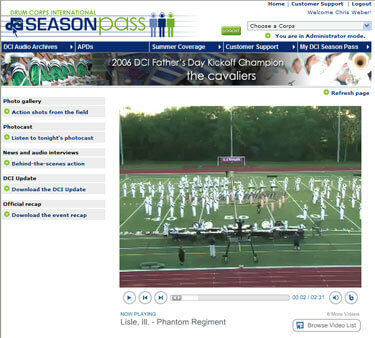 Read more reaction to the DCI Father's Day Kickoff live streaming beta test on drumcorpsplanet.com. Two official Internet event broadcasts are scheduled on seasonpass.dci.org for this season. The first is July 29, in Atlanta, Ga.; the second is scheduled in Madison, Wis., at the Division I DCI World Championship Semifinals event.